The 2018 Lehenga Lookbook- All Our *Favourite* Bridal Lehengas In One Place! If you’re guilty of spending a little too much time dreaming of your wedding attire, then this article is going to be the best thing you’ll read today. Whether you are a bride-to-be or her bridesmaid, we are sure you’re religiously going through umpteen Instagram feeds and building your very own dream wedding boards on Pinterest. And why shouldn’t you, finding the perfect wedding outfits for the bride is quite a difficult task. 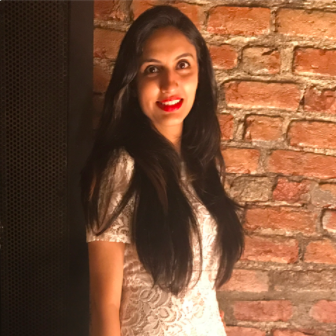 So to make your life a tad bit easier, we took it upon ourselves to search through Instagram, far and wide, and found some really pretty and unique lehenga inspirations that you’ll love! From the traditional red to offbeat wonders, here is our ultimate lehenga lookbook for the 2018 bride that you should totally bookmark! 1. A gorgeous pale pink lehenga with rich embroidery and thread work is probably what bridal outfit dreams are made of! And, that twirling pose is something we can just never get enough of! 2. Not many brides opt for light coloured outfits for their wedding functions, but this beauty did something that not many dare to do. She wore a pale blue printed lehenga for her mehendi ceremony and we think it’s such a great idea! Not going OTT with your outfit on your mehendi function means you can move and dance around freely, which is awesome! 3. A vision in green… and yellow! We just cannot get over the lush feels this outfit is giving us! 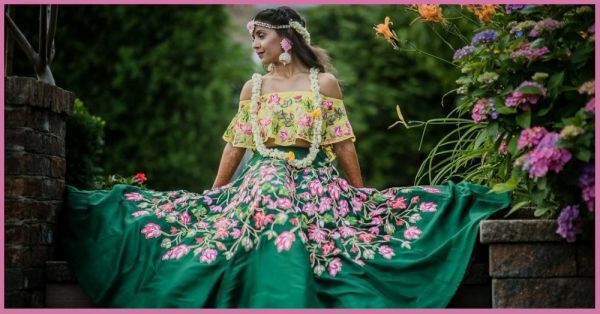 A gorgeous off shoulder yellow crop top, and a dark green skirt with big pink flowers embroidered all over them! This is nothing but #mehendioutfitgoals. 4. Red never has and never will go out of fashion, especially for a bride. This gorgeous one is a total stunner in her heavily embellished red lehenga. That smile, jewellery and elegance are just adding so much to the bridal portrait. We’re in love! 5. Florals are forever, and we can just not get enough of them, ever! This happy bride twirling in her gorgeous peach floral lehenga is a vision to behold! 6. Of all things bright and yellow! We’ve said this before and we’re saying it again... Yellow just brightens up the mood. And when the occasion is your mehendi and all you want is some sunshine, what better than a yellow lehenga to pep it up? 7. The swagger bride in her golden lehenga is a complete treat to watch, isn’t she? Just look at her bright smile and her henna clad hands bejewelled with kaleeras. Just so beautiful! 8. Blue is the new red, much? Okay, maybe not! But we are so crushing on all the brides who opted for this royal shade for one of their bridal outfits. Superb choice, we must say! 9. Red and orange extravaganza for the bride who likes to make it grand! This gorgeous bride in her heavily embroidered Manish Malhotra outfit is royalty redefined. The combination of bright blue with this stunning shade of pink is so fresh and vibrant. The lehenga complemented with the stunning tassel mathapatti, earrings and choker makes for a very pretty mehendi outfit. Whoever said wearing black at weddings is not the norm for brides... Well maybe it’s not the ‘norm’, but it’s your wedding. Be a badass bride and rock a black lehenga just like this stunning bride did here. This stunner nailed the twirly pose with hubby dear in tow and her baby pink lehenga on point. The golden thread and aari work on the lehenga is like the cherry on top! 13. Woven with silk… and love! Silk is an evergreen fabric. It is just not an outfit, it’s an heirloom, that is most treasured. This bride, in her magenta and red silk lehenga, will agree with us completely. 14. 2018 is going to be all about pastels! Looking at all these pretty brides nailing their pastel coloured lehengas with so much élan makes us believe that pastels are so not going anywhere from any of the 2018 bridal fashion trends too. 15. Cannot get over the beauty of this stunning bride in her light peach lehenga that BTW, she’s totally owning! 16. If there is one colour that can give a bride those princess feels - it’s white! We’re not kidding, and if you don’t believe us then just take a look at this bride’s pristine white lehenga walking down the aisle with her Prince Charming. Doesn’t this look like a picture out of a romantic novel? 17. We don’t know about blue, but grey is definitely the new red for our new-age brides. We’ve seen so many stunning brides don grey lehengas on at least one of their functions like sangeet or reception. We are in love with the grey trend and so hope to see more of it in 2018. It’s great to be experimental, and especially if you can pull off a unique colour as well as this bride does, then you’re definitely going to steal the show in a lehenga like this one. 20. All that glitters and shimmers is definitely gold and we don’t doubt it, AT ALL! Regal, royal or elegant! Whatever we say about this bride and her lehenga cannot do justice to how pretty she looks. 21. Dance all you want girlie, it’s your wedding after all! We just couldn’t take our eyes off this picture, and for reasons more than one. Her pretty orange and blue lehenga is obviously pretty, but the happiness with which she’s dancing is the show stealer for us! We hope we could help you in your search for the best bridal lehengas! Do tell us which ones you liked most!! !